The AW-CU282 is a combo Wi-Fi + Microcontroller Smart Energy Platform Solution. 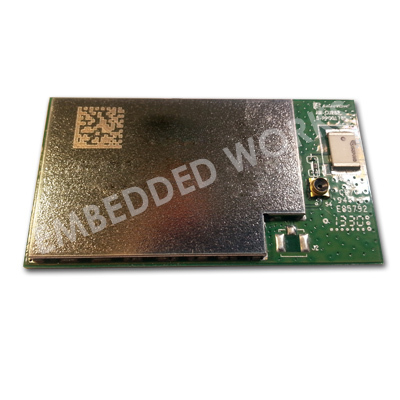 The platform builds upon the success of Marvell's first-generation Wi-Fi microcontroller platform using the Marvell Avastar� 88W8782 Wi-Fi System-on-Chip (SoC) and Marvell Easy Connect software. Adding new enhancements and capabilities, the second-generation Smart Energy hardware platform is built with a new highperformance Marvell Cortex-M3 microcontroller (Marvell 88MC200) optimized to run Marvell's Easy Connect software. It is paired with Marvell's industry leading low-power Wi-Fi SoCs to provide best-in-class performance and rich features including IEEE 802.11n, Beamforming, Access-Point mode and Wi-Fi Direct.